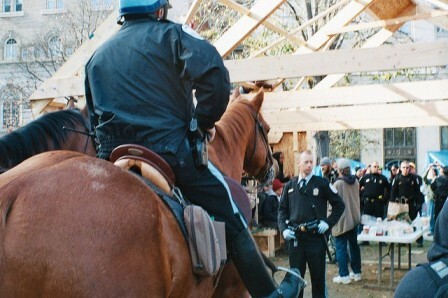 At noon today, Sunday, December 4, the Federal Parks Police entered McPherson Square to challenge the existence of a wood frame structure that had been erected to accommodate the Occupy DC General Assembly during inclement weather. 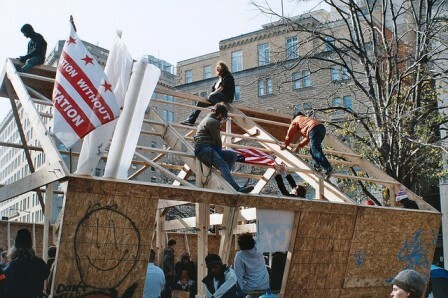 Several of the occupiers refused to participate in the removal of the temporary structure and positioned themselves in and on the framework. The police made an arrest before they even established a police line, removing a protester identified only as Justin, for crossing their line that was yet to exist. 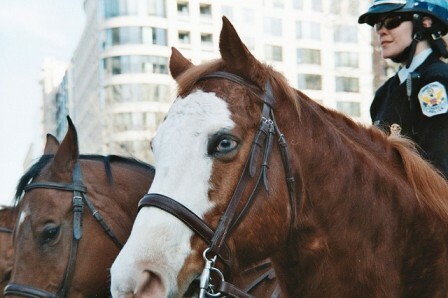 Shortly after, as the mounted contingent of the force proceeded to ram their horses into peaceful onlookers, two others were arrested for simply getting too close. As the situation escalated and arrests began to happen too quickly to enumerate and barricades were raised around the encampment. The writing was on the wall signaling the last days of this camp. Van Jones and MoveOn.org/Rebuilding the Dream’s imitation of Dr. Martin Luther King’s real Resurrection City is coming to DC tomorrow. 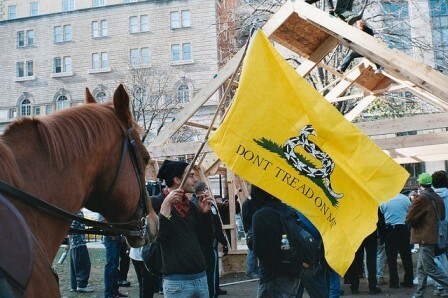 The protective hand that has sheltered the Occupy DC protesters seems to have taken a fortuitous day off hoping that few options will remain for the Occupy DC protesters other than to join the Democrat Party’s (almost) election year media spectacle. 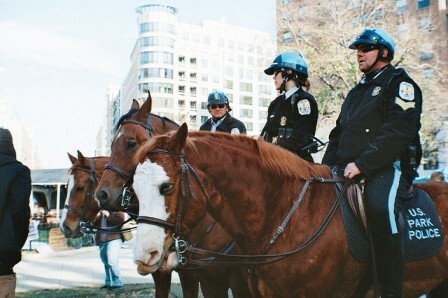 The original police line, that surrounded only the offending structure, was systematically expanded until it encompassed not only McPherson Square but the adjacent Starbucks where many protesters had gone to seek refuge. A police line was established around the Starbucks and protesters were instructed to remove their belongings from even near the Starbucks before the staff left… as if it’s illegal to be on the sidewalk outside a Starbucks once it is closed for the day. 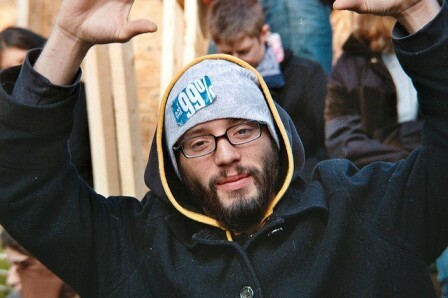 As protesters are bused into the capital tomorrow by Moveon.org / Rebuilding the Dream, and the SEIU, displaced and angered Occupy DC protesters will be licking their wounds and deciding who their friends really are. Cooperative efforts that had been planned for the week may be reassessed. If an incursion onto the Washington Mall is tolerated after the real, peaceful Occupation of DC has been removed, it will signal an attempt at Progressive and Democratic co-optation to those occupiers already gun-shy of partisan manipulation and exploitation. As Van Jones prepares for his triumphant entrance into the capital, the void left by the routing of the peaceful McPherson Square occupation may not prove the welcoming celebration that may have been anticipated. Occupiers sacrificed for the greater un-good of the Democrat Party are unlikely to do much to further the goals of those whose executive branch cabinet reads like a payroll roster from Goldman-Sachs. 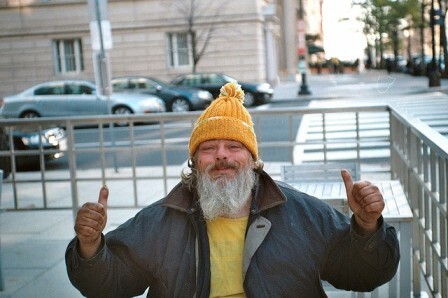 The calm and complacency in DC is over. The battle has come to the capital. 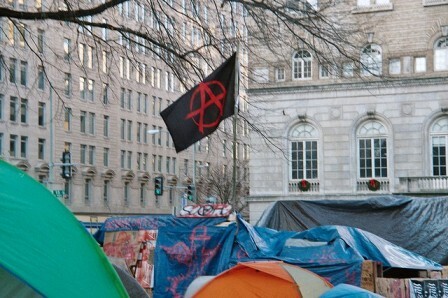 The heavy hand of the establishment has blasted the Occupy camp before the winter winds have even had their chance. Those that were willing to brave the winter are more than willing to stand strong against this minor inconvenience. 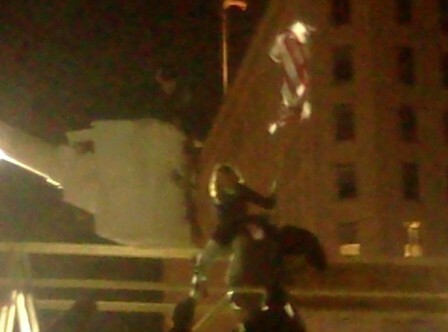 As of 6:30 pm, EST, three protesters remain on top of the structure. Police are bringing in armored vehicles to remove the structure and clear at left the southern half of the camp and a ‘cherry-picker’ for the protesters. 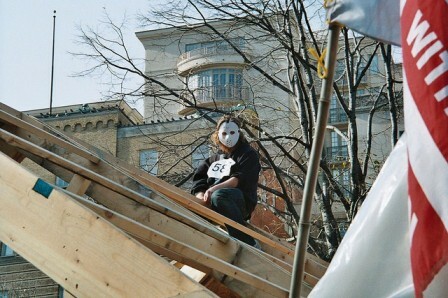 Tune in for details and live stream video to OccupyDC.org . Editor’s Note: All photographs by Gilbert Mercier and Liam Fox.